The forensic acquisition allows you to bring to court your screenshots with legal value. FAS is designed to be used even by the less experienced user to collect digital tests independently, at any time of the day. It is not necessary to be an IT expert to acquire the proof; just install the FAS App, start it and start taking pictures on the screen of your phone (in technical jargon make screenshots) the rest thinks all FAS. The screenshots will be crystallized and sent to the FAS Server infrastructure with all the necessary content. With a simple "tap" the whole acquisition procedure is monitored, crystallized, saved and authenticated. The proof acquired through the FAS App is technically genuine and reliable. The value of the digital test is based on how it is acquired: in order for a digital data to become proof, it is necessary to guarantee certainty and compliance between the forensic acquisition performed and the data present on your telephone. The proof acquired by the FAS App, together with the Server infrastructure used, and advanced security implementations is absent from the possibility of counterfeiting the acquired elements. The proof, therefore, is genuine and reliable and immediately presentable in court or extra-judicial. FAS is the only App - first in the world - that guarantees authenticity, compliance and inalterability of screenshots captured on your phone. FAS is an innovative service that guarantees the rigorousity of the acquisition method combined with ease of use. FAS is the only App able to demonstrate that the collected evidence is authentic, conforming to the original and unalterable. Its simplicity of use and its power allow the common user to act quickly and independently without the need for an IT consultant. FAS has been developed in compliance with national and international regulations, scientific papers and best practices of Digital Forensics. In order for the crystallization of the screenshots to be considered valid and effective as evidence of a judicial proceeding, it is necessary to respect procedural legal rules as well as to follow best practices recognized by the forensic scientific community and experts in the field. 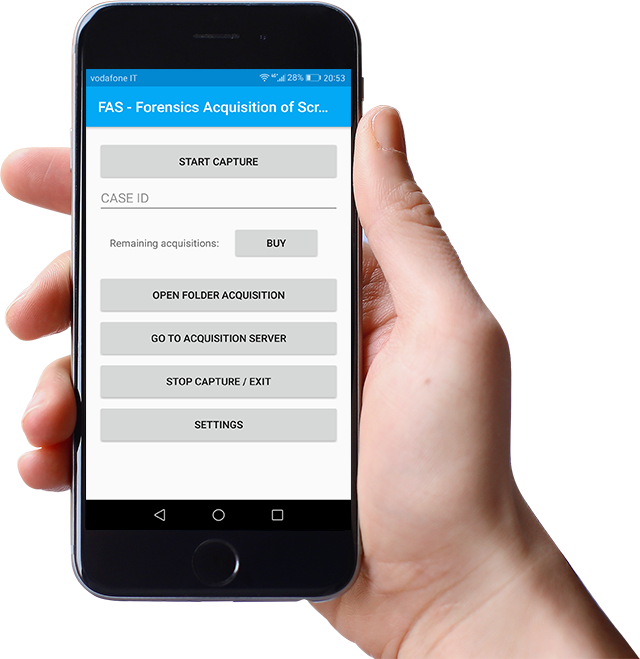 The forensic professional and the forensic consultant can give their customers the opportunity to acquire at any time of the day what happens on their smartphone. The forensic professional and the forensic consultant have a price list reserved for acquisitions and can bill the customer all the acquisitions made by him. With FAS, the customer can independently make screenshots of their mobile phone in the presence of a crime 24 hours a day. The forensic professional and the forensic consultant will have a reserved area on the Web in which to view all the activities carried out by the client in real time and the ability to print or export a report of the acquisitions for subsequent analysis and technical expertise.